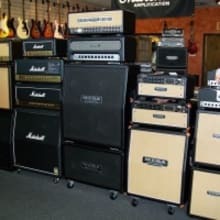 We take pride in providing a large selection of the best acoustic and electric guitars, bass guitars, amplification, effects/pedals, and instrument accessories -- devotedly evaluating and stocking quality American-made and internationally renowned products that we would want to play (and of course own) ourselves. Take a close look at the manufacturers we represent. In the Chicago area, we believe "A World-Class Guitar Shop in the Northwest Suburbs" is by no means bravado. Yes ... Goodtime Music offers an outstanding selection of quality, modern musical products. And we nearly brag about our outstanding Guitar Repair and Electronics Repair department and Premier Services. However, even with these world-class products and professional services in place, we aspire to achieve something more. Our simple cornerstone philosophy — nurture the musical community.